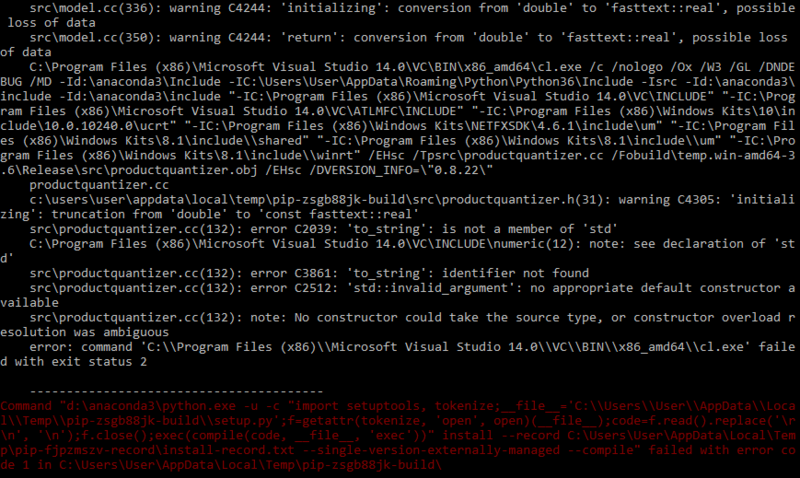 Can @jeremy guide me on whether or not its possible to install fastText in Windows (running Anaconda as admin)?
" install --record C:\Users\User\AppData\Local\Temp\pip-fjpzmszv-record\install-record.txt --single-version-externally-managed --compile"
SOLVED - pathlib.py was not installed correctly. whew! Hey does anyone have a translate notebook running? My os does not seem to work with PosixPath even though I’m running python 3.6.4 and I’d like to know if anyone else is hitting similar problems. So I have been converting all paths to strings using str() to open files, which is kind of a gross workaround, but it usually works. because the PosixPath problem comes up from code inside text.py. I just want to make sure it’s just me having this problem (so probably a configuration error) before I go further in debugging wtf is up! 2 # triggered by something inside fastai.core.SingleModel. 77     ends with a separator.""" Try giving the string version for the Path object when you’re using os library. Just wrap it around a str and you should be good to go. Your suggestion is simply to continue my workaround. I’ve run into a situation where the workaround doesn’t work. os.path.join is expecting a string. Did you use Path to point to your data? Maybe use the python debugger and check the types just incase. Thanks for trying to help read the stack trace. However the problem is that it seems like for everyone except me, os.path.join expects PosixPath. My specific question is what other people’s experience with os and PosixPath is. According to the python docs for PathLike here, PathLike is an abstract base class that contains the fspath method. Maybe my question is why doesn’t PosixPath have the fspath attribute. I think uninstalling and reinstalling pathlib should work, but I manually removed the site-packages file (which didn’t have fspath defined in it—I checked with $cat pathlib.py | grep fspath ) and replaced it with the file that seemed more up to date manually. Ah, it’s in translate.ipynb but I had jumped straight in to devise.ipynb. You should be able to double the learning rate then too! Just out of curiosity, is there a faster way to decompress a huge file (like full imagenet 156GB) other than tar -xzf and wait? Not really - although people shouldn’t be using gzip with image files, so if you have the ability to choose how it’s saved, don’t use the z flag to tar. Also be sure to decompress it to nvme or similar if you can. More seriously I’ll switch to Paperspace for this. Leave it as jpeg - it should stay at ~170GB. I don’t understand this comment. It seems to imply that you decompress the JPEG? Oh, I guess you mean “only download the JPEGs”?